This is a great one pot, quick, and easy dinner. I love this recipe when you need to make dinner in 30 minutes or less. You can have this on the table in 30 minutes. If you add salad you have a great meal. Recipes like this are great for busy days. Most of the ingredients are things you usually have on hand. In a large skillet, cook beef, onion and garlic until meat is no longer pink; drain. Add the tomatoes, water, tomato paste, parsley, oregano and salt; mix well. Stir in pasta; bring to a boil. Reduce heat; cover and simmer for 20 minutes or until pasta is tender, stirring once. 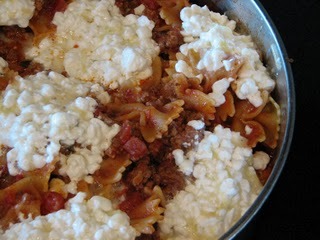 (if it gets too dry add a little more water) Combine cheeses; drop by rounded tablespoonfuls onto pasta mixture. Cover and cook for 5 minutes. That looks so good! I’ll try it, we love one skillet meals here! Yes, it is kind of like a lazy lasagna.